Its official! The Helpful Guys in Blue and the Los Angeles Dodgers’ Boys in Blue are teaming up to share Honda’s helpfulness with Dodgers fans! All summer long Team Helpful has been surprising fans with perks and helpful hands — from free parking for Honda drivers to free seat upgrades, complimentary tickets to a future game, and seat escorts. 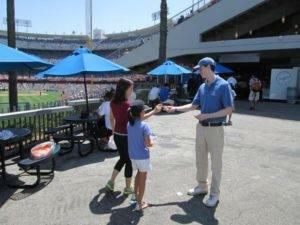 Around the stadium, the Guys in Blue have been spotted helping out at customer service kiosks, picking up trash to keep the stadium clean, and passing out helpful essentials such as sunscreen and lip balm. 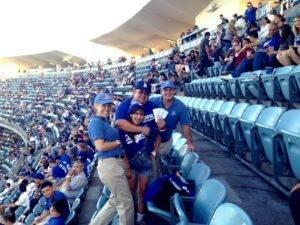 Plus, they’re lending a charitable hand. 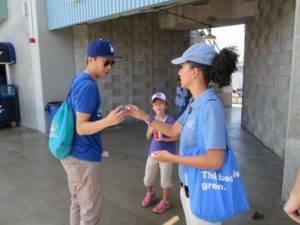 On August 17th, the Helpful Teams joined the Dodgers at the ‘Fresh Start Festival‘ to distribute backpacks and school supplies for the new school year. 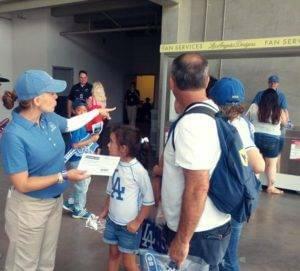 And Team Helpful isn’t stopping with the Dodgers. You can find the Guys in Blue helping out at the Galaxy Soccer Clinic, and coming up they’ll be at USC and UCLA home games, helping fans in all sorts of unexpected ways. To keep up with the latest in helpfulness, be sure to ‘Like‘ us on Facebook and ‘follow’ us on Twitter @HelpfulHonda.